Pineapple (Ananas comosus): growing, planting, caring. Pen, pineapple apple pen ! Ok, this is a stupid song - but you can grow pineapples indoors, it’s fun ! The pineapple is a tropical plant with an edible multiple fruit consisting of coalesced berries, also called pineapples. It is a herbaceous perennial, growing to 1.0 to 1.5 m (3.3 to 4.9 ft) tall, although sometimes taller. In appearance, the plant has a short, stocky stem with tough, waxy leaves. When creating its fruit, it usually produces up to 200 flowers, although some large-fruited cultivars can exceed this. 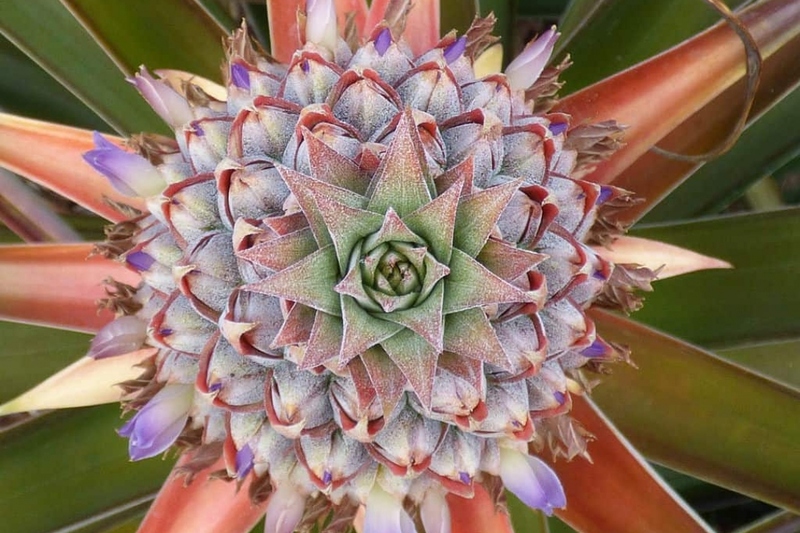 Once it flowers, the individual fruits of the flowers join together to create what is commonly referred to as a pineapple. The pineapple is an herbaceous plant species that can reach 1 m to 1.50 m in all directions in its natural habitat, with a rosette of long lanceolate leaves of 50 cm to 1.80 m, toothed, and sometimes smooth. Pineapple flowering is characteristic of Bromeliaceae, with a single crown of short leaves at the end of a stem, surmounting a set of ephemeral blue flowers (living for only one day) without a peduncle, giving numerous conical and sterile berries, which individually grow to meet each overs, forming at maturity the pineapple that we know. Pineapple is therefore a compound fruit, also called infructescence. In pots, plant in a mixture of peat and sand, after spreading at the bottom of the tray gravel for good drainage. Choose a pot of at least 15 cm in all directions. Place the pot on a layer of pebbles that you will keep moist. Find a spot in the light, without direct sun away from drafts and warm: this plant does not support a temperature below 15 ° C, so it is better to have a heated greenhouse. High ambient moisture is essential. Every two or three years, repot your pineapple, cut 1/3 of the roots, and replace 1/3 of the soil. Good luck for big trees ;-) Nah, we're just joking : in this case just replace the top of the soil by adding potting soil, or compost, on about ten centimeters. How to water well? You've planted your pineapple in peat, which is acidic, so do not ruin this quality by adding hard water: use rainwater instead! Just keep the soil moist, no need to provide a pool for your pineapple. Your pineapple will need water regularly the first weeks after repotting, water it every day. Then, during the season - from March to October, water twice a week. In winter limit watering to one every ten days. Pineapples are susceptible to only one pest; mealybugs. It would not be very serious if they were not vector of viruses. If you see a reddening of the leaves of your pineapple, it is a symptom of viral attack, and at this stage there is no cure. To prevent it watch the back of the leaves, and if you see small white clusters: sprinkle every 3-4 days the leaves with a mixture of a liter of water, a teaspoon of black soap liquid, a teaspoon of vegetable oil and a teaspoon of alcohol at 90 °. To compensate for the low moisture inside, you can spray the palms with soft water and place a cup filled with clay balls and water under the plant. Remember to regularly remove the dust that is deposited on the leaves with a damp sponge: the leaves will better fulfill their function of photosynthesis! Every 15 days during the season, regular liquid fertilizer - such as compost juice diluted 1/10 - will help your pineapple.